Now available to purchase: Andrew's Previews 2016. 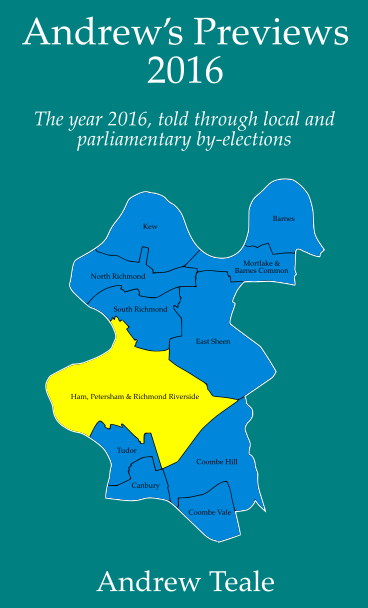 This is a permanent written collection of all the by-election previews published under the Andrew's Previews series in 2016, whether for Kristofer Keane's blogs or for Election Data, and also including the results of each by-election featured. If you want to relive the ups and downs of that crazy political year which was 2016; or if you've only come to Andrew's Previews recently and want to read more; or if you want to know more about the political and demographic map of Great Britain; or if you just fancy finding out about bits of Britain about which you might know little and visit less, then this is the book for you. If you are looking for an interesting Christmas present for somebody with those interests, then this is the book for you. By buying the book you will help to support the research required to keep Andrew's Previews, and the Local Elections Archive Project, going. So, what are you waiting for? Buy Andrew's Previews 2016 now from Amazon!